I’m admittedly behind in my reading… this report was issued last March from NTEN, but that doesn’t discount the value of it, nor keep me from pointing out a big chunk of the IT picture it misses. The “Nonprofit IT Staffing: 2009 IT Staffing & Spending Report” from NTEN in conjunction with the NonProfit Times gives us some great ammo when we’re trying to build a case that our organization needs a strategic plan for its use of technology, that we need more IT staff or better use of the IT personnel we have, or even that training does more than educate our staffers. First, the helpful stuff. Then I’ll get to what the report DIDN’T give us, but should have. No surprise that larger organizations spend more and are farther ahead as leaders in tech use. But here’s an interesting statement: “Though the median percentage of an organization’s overall budget allocated to IT was 3%, this figure tended to be significantly higher among small and medium organizations that large or very large.” I take this to mean that medium and small nonprofits are investing a larger percentage of their budget, but are still struggling as stragglers. Organizations considered IT leaders are more likely to have a strategic plan for their technology and its use, and more often conduct ROI on their IT projects or programs than non-leaders. “[O]rganizations satisfied with their IT staffing levels were more likely to provide technology training to employees.” Good training = greater satisfaction. In some cases, that training was offered as incentive to highly valued IT employees to retain them during tough times when higher pay wasn’t possible and/or the workload increased because of reductions in staffing. Good training = good incentive to keep appreciated employees. Here’s another fact that this survey supports: smaller organizations are less likely to participate in surveys such as this one — they continue to be the “hidden element” when it comes to getting a finger on the pulse of the small association/nonprofit sector. In this case, just 15% of the survey respondents work at organizations with annual budgets of less than $500,000 — which is actually the majority of nonprofits. The report includes lots of valuable information to be sure: IT expenditures, recruiting, and outsourcing among it all. 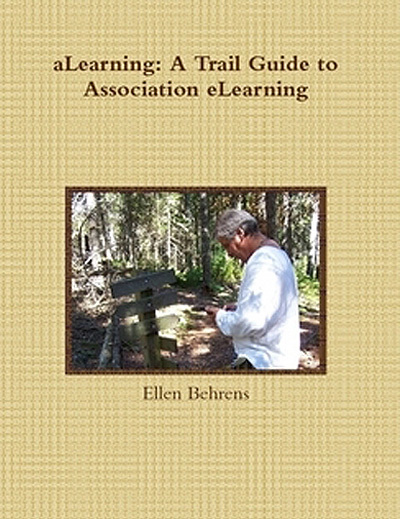 What about that ever-important linkage to elearning? What about learning content management? …but you’d be wrong, so don’t even start down that road. Few organizations with elearning programs are doing it without the use of their IT. eLearning is an essential element in many nonprofit technology portfolios, and omitting it from the mix weakens the value of the study, particularly when the study could have given us a good picture of where elearning fits within the overall IT picture. What’s an IT staffer’s role in helping an organization implement elearning? Are IT staffers involved in the integration of AMS systems and LMSes? To what degree? What percentage of their time and budget is devoted to implementing and managing elearning? Do they have any security or other concerns about how elearning is deployed in their organization? Do they *want* to be more involved in Webinars and other elearning offerings, at least in an advisory capacity? Someone please tell me there are plans to include elearning in the NEXT NTEN survey…. “What Are the Core Competencies of a Trainer?” This great question was posted by Ling-Huey on ASTD’s LinkedIn forum, and her question generated dozens and dozens of comments. Whew! That’s a lot! But notice how many of these “competencies” are actually personal traits? “Core Competencies” are usually skills and knowledge identified as being necessary for performing a function to an acceptable level of competency (i.e., “ability to properly structure instruction with respect to Kirkpatrick…” or “ability to manage the learning environment”). But aren’t those personal traits as important? Of course they are! We can define some of them as competencies — the ability to communicate clearly and perform active listening skills, for example. But exuding enthusiasm and passion or having a sense of humor? It seems to me you either have those qualities or you don’t. Even so, they’re qualities that the best trainers (and facilitators) possess, don’t you think? So, do we handle the personal characteristics as part of the job interview when seeking good trainers, and leave the competencies as job performance criteria? What do you think? How do you define a great trainer/facilitator? How do you balance the personal characteristics that make a great trainer with the core competencies of training? ABC… It’s Easier Than 1, 2, 3! What’s easier? Acronyms! Acronyms for elearning, that is! Well, aLearning can help sort it out! “eLearning Alphabet Soup,” the newest aLearning Fundamentals tutorial, has now been posted! As with all tutorials, it’s free, and this one has a companion “Behind the Scenes” session so you can see how it was put together. Just click the aLearning Fundamentals image on the left to go to the launch page where you can get started. Remember — aLearning does not collect any of your information. There’s no registration, no hoops to jump through. Just click and learn. Makes it easy to share these resources with your members, colleagues, clients — anyone you think would find value in them. Book mark the site or this blog so you can check back for these updates. Now what are you waiting for?! ?